In CURA 2.7 and earlier the infill pattern was fixed relative to the bed. This means that by careful positioning of the print could give the best internal structure. 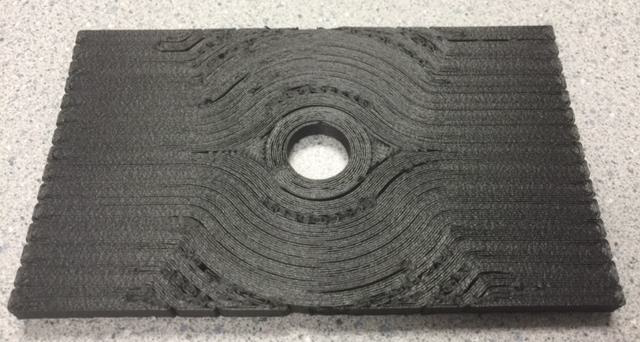 In CURA 3.0 the infill pattern is fixed relative to the print thus the position of the infill pattern cannot be moved. If you are trying to create the lightest stiffest structure making best structural use of the infill matters. Is there are parameter in the settings of 3.0 that fixes the infill pattern to the bed as in 2.7? Actually, it is better now (I would say that as I implemented the change) because you get new settings called infill x offset and infill y offset that lets you position the infill relative to the middle of each mesh. This means that the infill will not move when you move a part on the bed or have multiple copies of the part. Hope this helps. Is there any idea for infill pattern to achieve this flowing above? You can get something similar (but a little different) by setting the shell width to basically infinite. Set it to 200mm. That way there will be no infill and the shell will be so thick it connects the outer surface to the inner surface. 1) to create microchannels for air/liquid to pass through? 2) To control grain/stress direction? 3) To make the part weak in certain areas such that it can be broken apart into specific shapes? Like an adjustable shim? Do they need to reach the left and right sides or is it okay if the pattern turns 90 degrees when it gets close to the right and left sides? My goal is "to control stress direction". The material is carbon-fiber filament. I want to control fiber orientation. The only option to solve this problem is to divide section and apply different infill patterns. However, since the infill option is very limited, (eg : lines, concentric, etc). I can't design the tool-path as exactly what I want. I am currently looking for a slicer software to achieve custom infill pattern, tool-path. Any idea would be appreciated. That was exactly what I needed to know. I don't think you can control fiber orientation as it is chopped up into tiny pieces and mixed in with the filament and the fibers are at random orientation. Is this Nylon with CF or is this PLA with CF (or maybe there is another material. Because the printing pattern should not matter. But it does if you have underextrusion or if you are printing a higher temp material like Nylon and you aren't getting good bonding. So let me know and I can help you with that. I've done lots of tests of material strength. I have a machine that tests modulus (a flexibility test) and ultimate strength. I have tested parts in different orientations. when you do it right (we can get into that later), it doesn't matter what direction you print. However if you have a mark forged printer, the fibers are LONG and it definitely matters. but Mark Forged has it's own slicer so I assume you don't have a Mark Forged. Thanks for your answer. But there are many reports that shorts carbon fiber products exhibit anisotropic material properties depending on printing directions. If continuous fiber filaments show 100% orientation, short carbon fiber filaments show 91%, not random orientation. Did you try setting shell to a high value such as 200mm? For the part above it will improve the pattern especially where I assume the part is weakest (in the middle). Anyway - so this is how you get what you want - but you might not like it. In CAD create several - maybe about 6 - thin wall shaped holes through the part. So it's like a long slit that goes from nearly one end of the part to the other end. The thickness of this slit can be very small - say 0.01mm such that in reality there is no gap (the filament is all touching across the slit). And set shell to a high value. These two things combined can get the pattern you show above. Was that clear? Or was that confusing? gr5 thank you for your answer. I am little bit confused. If you can, could you explain it with some figures? 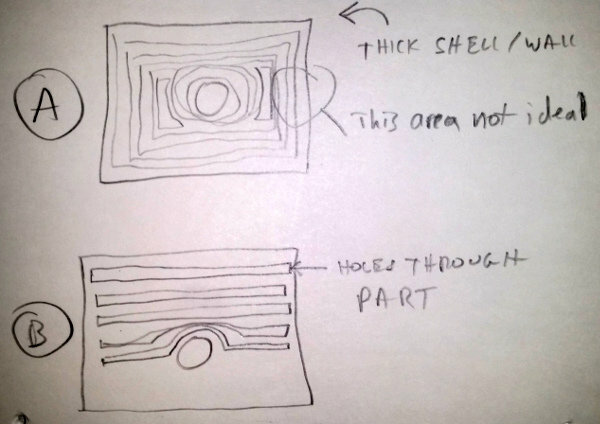 Method A is to simply increase shell/wall width to an extreme - say 1 meter. Anything larger than the size of the part will do. The problem is you don't get the strength you wanted in the circled area. Maybe other areas. But you get strong walls around the edges - similar to your goal I think. Method B you put in these slots in cad. They are rectangular holes all the way through the part. But make them only 0.01mm wide. Small enough that when cura prints them it will seal them up solid across the gap. You might have to expleriment - they might have to be larger than 0.01mm. I haven't tried this but I've sliced other people's designs (emmet on thingiverse) who taught me this technique and it worked in cura at the time. You can shape these "holes" any way you want. You can even make them tubes instead of rectangular. They can be any shape. Cura will follow the shape as it thinks of them as walls. Note that the width is exagerated in my drawing. Note that I ended the holes before edge but you can even separate these into "separate parts" meaning have the slot reach all the way to the end. Possibly, ideally the holes should be internal only such that the top and the bottom prints a diagonal pattern that helps melt everything together. Like plywood with it's alternating grain. Basically you can get cura to make the grain go into any complicated pattern you want with these "internal holes". Thank you for your answer. I understand the plan. If the rectangular holes are considered as cutting gap (0.01mm), what's the thickness of remaining plywood? Are they extruder nozzle diameter? cura positions the nozzle such that the line width will extrude right up to the edge of the wall. So for example if your nozzle is 1mm in diameter and line width in cura is set to 1mm then cura thinks of all lines as being 1mm in diameter. If you print a cube - or a layer of that cube that is 10mm by 10mm then it positions the X,Y such that it prints 0.5mm (half the nozzle width) INWARD from the wall. Such that the wall ends up being positioned perfectly. In theory. Plastic can shrink and other things can happen. But it's pretty close. So if you make these slots 1mm wide you will really get 1mm wide air gaps. If you make them 0.2mm wide there will indeed be a gap. But if you make them 0.01mm wide that is too small to create an air gap and the plastic will just flow into the "gap" and fill it all up. Does that make sense? Just try it in cad/cura and look at the result in layer view. Ideally I would do this kind of thing in openScad which is very parametric and programmable so you can have a parameter that says how far apart the slots are and subtract these slots from the part automatically and output a "grain controlled" part. But programming (and openScad) are not for everyone! Some hate it. Thank you gr5. My focus is tool-path. What's the infill pattern? If I select zig-zag pattern and the width of plywood is bigger than nozzle diameter, tool-path would be like the right side in the figure above. I want to make the tool-path like the left side as shown in figure. There's no infill pattern quite like that. That's why I said to make the wall width 1 meter. As walls get thicker and thicker basically it crowds out all the "infill" and so it doesn't matter what infill pattern you use as it's using the "wall" pattern. Which is to make concentric walls until you fill everything in. Is that clear? Again if you can make a model in cad and play with cura settings (set wall width larger than the print) things will be more obvious. I regret using the word "plywood". I think you misunderstood and now are using it in a way that I don't quite understand. when I mentioned it before it was describing something 3 dimensional. I don't think you are ready to think in 3D yet. I think we should concentrate on 2D - concentrate on what you want a single layer to look like. Your drawing is from above, right? My drawing was also meant to be from above. When I mentioned "plywood" I was saying that some layers look like our drawings, but then IN BETWEEN layers might look completely different. Maybe I was assuming all of our drawings were from above and you were assuming all of our drawings are a side view? If so that would explain a lot! I have a question about CURA. As you know, Simplify3D allows users to apply different infill patterns to individual sections of one part. 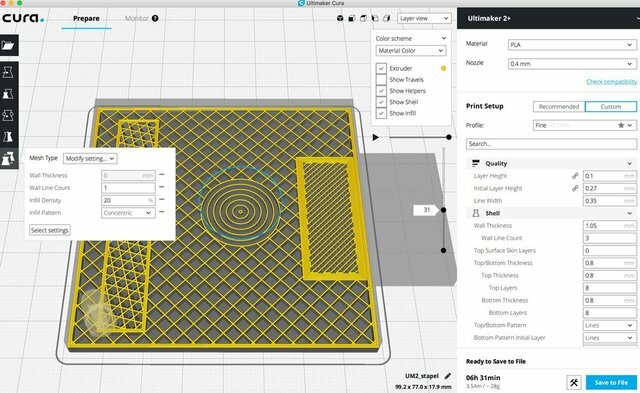 Does Cura have the same function? As far as I am aware in CURA the infill pattern once set is common for all the items on the bed. However I for one could certainly make use different infill patterns and densities for different parts of the same object! Thanks for your answer, quorneng. You said "However I for one could certainly make use different infill patterns and densities for different parts of the same object!" is it possible in cura? How? Can you explain more details? When making a complex part that is required to be stiff but as light as possible the type and density of the infill pattern is important and needs to be different for the different shapes within the part. As part of an RC plane it is rather a specialised application but being able to use different infill patterns on different same object would be useful.. I did start my original comment with "As far as I am aware" but with the benefit of your very informative video I am now aware! Thank you. However, the video shows that different infill pattern is applied to two different objects. I am saying one object. Cut an object into several sections and apply different infill patterns. Simplify3D can do that. I am wondering if Cura is able to do either. Yes, within one object you can position several infill meshes and each can have its own infill style/density, etc. How? can you show me?